Gunung Nuang is Kuala’s Lumpur’s closest major mountain. It is one of the highest peaks in Selangor and it is very popular because both trailheads are only around one hour’s drive from the centre of Kuala Lumpur. Despite being so close to KL, the mountain is still home to a lot of wildlife and hornbills are frequently seen on the Janda Baik side of the range. The most popular trail is the Kuala Pangsoon trail from Hulu Langat, which is on the KL side (south-west). Most hikers require about 9-10 hours in total (5 hours up and 4 hours down). The trail from Hulu Langat is as follows: Pangsoon (200m) – Camp Lolo (580m) – Camp Pacat (1,080m) – Pengasih summit (1,450m) – Nuang summit. It is about 5km along a track from the trailhead to Camp Lolo, after which the real ascent begins. Unless you can arrange transport to make a traverse of the mountain straightforward, we recommend the easier, shorter and wilder trail from the north-east at Janda Baik (approximately 500m above sea level). Not only will you start higher up, but you will also meet less hikers and see more wildlife. This trail requires around 4 hours up and 3 hours back down. Janda Baik itself is almost the opposite of the nearby Genting Highlands monstrosity. Spread out over several kilometres, this very laidback and traditional valley feels a long, long way from Kuala Lumpur. In the late 1980s, when this trail was first opened, there was still evidence of elephants, pangolins and tigers. Most of these have sadly disappeared from the forests, being poached, dwindling in number and migrating eastwards, but there are still tapirs, siamangs and black panthers. There are also leeches, but in dry conditions you may only encounter one or two. The Janda Baik route is also less bureaucratic than the Langat side, with no official entrance ticket and merely a barrier and forestry sign (545m) on the track leading towards the forest. From this barrier, follow the track until you reach a junction (670m) with a narrow, muddy trail slightly on the right leading into the forest. There are a few bamboo obstalces here before the trail becomes much clearer and easier, following a water pipe for a significant way, past a small stream on the right (790m) before dropping down to a small river (775m) with a pleasant waterfall just two minutes away to the right which is worth a minor detour on the way back down. After the river, the trail gets more steep for a while, but for the most part it is very pleasant, albeit rather muddy in some places. 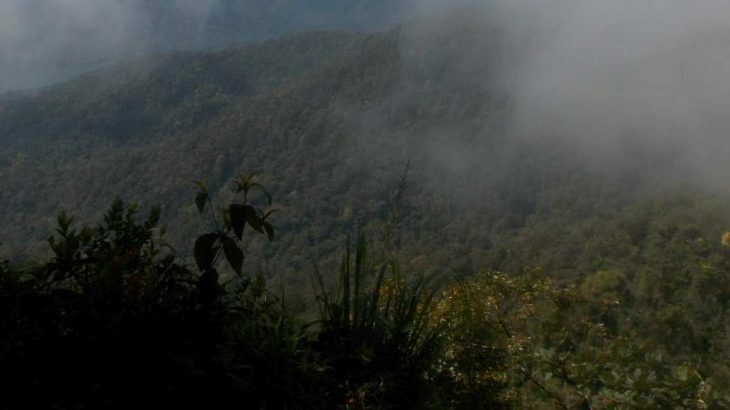 At 1,250m, you will reach a minor junction with a rarely-used trail to the obscure Bukit Repin (1,341m) which is a considerable distance away. There are boundary markers in this section of forest signifying the meeting of the states of Pahang and Selangor. After this are some large boulders (1,390m) and a couple of steep sections with small ropes to assist you. Soon you will be at a small metal barrier on the right of the path, where there is a great panorama in clear weather. Two minutes later you will be at a small clearing which is the summit, marked with a sign, a flag and a large metal ‘beirut’. There are also a couple of very tame squirrels so keep your bags securely closed unless you want to lose your snacks to them! Getting there: No easy way to either trailhead with public transport. Best use Grab, taxi or private car. Accommodation: Lots of simple riverside accommodation spread out over several kilometres at Janda Baik. Permits: Register at the Langat trailhead. Not required at the Janda Baik side. Usually closed November to January. Water sources: Available from the river at Camp Lolo om the Langat route and the waterfall (775m) on the Janda Baik route. I had originally wanted to do a full traverse of the mountain, but as I was alone I thought I would have to wait to see if I met any other hikers on the mountain who were doing similar. Janda Baik is really spread out – numerous ‘chalets’ and simple homestay accommodation over several kilometres near at least one picturesque river (Sungai Benus). At 500m, the temperature is quite pleasant. Don’t expect wifi here and it may be tough to find beer here unless you bump into the right person – most places are very simple. Managed to get put in touch with Pak Zaini, who runs his own chalet accommodation just over 1km before the Nuang trailhead and is very knowledgeable about the area. He and a friend actually made the trail up Gunung Nuang back in 1989, without government money, just to encourage tourism on this side of the mountain and so that people could hike from here as well as from the Hulu Langat side. They camped near the waterfall and it took several days of machete work. We agreed to meet at 7am the following morning. Like many mountains in Peninsular Malaysia, it is closed November to January, so quite lucky I had this planned for the start of February. It’s a shame this information is so difficult to find – perhaps now people can use Gunung Bagging to find out, but why the authorities can’t put together a simple blog site with info of when places are closed is a mystery. Perhaps they don’t realise some people travel a long way to visit these places and it is a major inconvenience to find they are closed. It seems the Hulu Langat trail is still closed…. opening at the start of March according to one local in Janda Baik. The Langat trail was closed much of 2018 due to an unsafe part of trail and a death or serious injury on it. Very sad, but it shouldn’t take them more than a couple of weeks to put things right again. They don’t close a road for 6 months if there has been an accident due to a pothole. They fix the problem and get it open again as soon as possible. Similar respect for hiking trails and those using them does not appear to exist. It took us 3 hours and 30 minutes to reach the top. Not bad. Lots of siamangs around but not as noisy as during the summer months. One leech at the top, but you can usually expect to meet a few more. A group of unfriendly Russians were at the top, feeding a couple of very tame squirrels that live up there and are happy to eat what hikers can give them. The Russians said almost nothing to us, perhaps simply due to having no manners at all, but also maybe because they came up the Hulu Langat side which is still closed to hikers so they may have been worried about chatting. They were also burning a tree branch to try to keep warm (Russians ought to be used to what are actually rather warm temperatures at 1,493m near the equator) which I found pretty appalling. Destruction of the natural environment. The clouds lifted for a few brief minutes so we could see the reservoir or lake down below. Very pleasant view. On the way back down we heard several hornbills flapping their wings above us. Lovely. Lots of other birdlife too. We were back down in 2hr 30min. Near the start of the trail you can see the hideous towers near the top of Ulu Kali (Genting Highlands) in the distance. Like in many parts of Malaysia that are not major tourist attractions, it can be really tough to travel around without your own car. A friend of Pak Zaini’s took me to the closest bus stop for getting back to KL. This is 15 minutes away on the main, busy road at Bukit Tinggi, a majority Chinese village. Alas, there was no timetable at the shelter and the only buses I saw were express ones that are forbidden from stopping here. Ludicrous situation. Hundreds of vehicles speeding towards KL (39km away) but none of them able or willing to stop despite me needing help. If this is development then I would take Indonesia’s informal lack of development anytime, where at least bus drivers will stop if you want to get on. Given that I had a plane to catch back to Jakarta, I started to worry. I asked at the nearby market, and a woman tried to help by ordering a Grab but no drivers were available. The next local “Central Pahang” bus might not be for another 90 minutes! So I walked up the hill to the police station and asked the officer if he had any numbers for drivers. After a long wait of almost an hour, a driver turned up and I paid the rather inflated price of RM100 to get to Sentral station. Once again, travelling alone in Malaysia is terrible on the wallet and just cannot compare valuewise for what you get in most of Southeast Asian nations. Things are more expensive but not any better. It might be easy to get a Grab from KL, but getting one back to KL is another matter entirely. The journey however was brilliant – really clear weather, with phenomenal views as we sped down to KL. Batu Caves and Genting Highlands on the right and the stunning Bukit Tabur ridge on the left with Gunung Nuang behind. Folk who live in this area in apartment blocks must have some wonderful images of the hills here at dawn and dusk. If you wish to share on the site, please email me, as I didn’t manage to get any photos on this particular day. It was a very interesting weekend in the end, exploring the hills near KL, both the overdeveloped and relatively undisturbed. Hi Dan Quinn. Enjoyed reading your story. I am interested to do Nuang and looking for someone local to take us. Would you mind sharing Pak Zaini’s contact number or the name of his chalet. Thanks!